The future is digital – but how can HEIs best embrace technology to benefit staff and students? Phil Richards, chief innovation officer at Jisc, outlines key ideas and suggestions that emerged from the organisation’s Digifest event. Advances in HE data should be on "fast forward" -- not "pause"
Data and learning analytics are like "gold dust" in higher education, and the sector cannot afford to put advances in this area on pause, argues Graham Cooper, Head of Education at Capita Education Software Solutions. The use of big data to improve the student experience is a rich seam that universities are increasingly mining. In this Good Practice Briefing, HEi-know looks at a variety of approaches that have been taken by eight universities to collect and make use of data to enhance learning, and provide better support and feedback for students. Dave Hall, Registrar and Chief Operating Officer at the University of Leicester, finds the long-running argument over whether higher education's primary purpose is utilitarian or more holistic continues to dominate debate in the media on developments in the sector. The Royal Statistical Society has warned that the Teaching Excellence Framework is misleading thousands of students by failing to meet the standards of trustworthiness, quality and value that the public might expect. New analysis by Prospects reveals which UK cities offer the best value for money for graduates taking their first steps on the career ladder. This week’s news for once truly mirrors the issues focusing minds in HE, finds Rachel Hewitt, Director of Policy and Advocacy at the Higher Education Policy Institute. Parents are more likely to advise their child to go to university than take a degree-level apprenticeship, with middle-class parents more likely than poorer parents to offer this advice, according to new research. The Office for Students has announced it is to fund an “impact and evidence” centre to help universities meet tough new targets to eliminate equality gaps in two decades. The shape of things to come in higher education? Policy decisions now could lead to big changes in the future for higher education, suggests Stephen Isherwood, chief executive of the Institute of Student Employers. The past week’s higher education news demonstrates that there are certain expectations of universities that policymakers, HE leaders and the Augar review are expected to address, says Johnny Rich, Chief Executive of the Engineering Professors’ Council and Chief Executive of outreach organisation Push . From this September, students will be able to opt to study an accelerated two year degree, as opposed to a traditional three year course. Professor Malcolm Todd, Provost (Academic) at the University of Derby, discusses why universities should consider the change in legislation and look to offer accelerated degrees. Jenny Shaw , Student Experience Director at Unite Students, draws lessons on the higher education sector's efforts to improve the student experience from a week of HE news and views. Research England has selected 21 English universities to take part in a pilot Knowledge Exchange Framework (KEF), which will run between February and May 2019. As concerns grow over students’ mental health, undergraduate Alice Wright highlights some of the realities of being a university ‘fresher’ and the problems that she says universities are largely ignoring - including unsafe drinking habits, loneliness and a lack of belonging. Professor Liz Barnes, Vice-Chancellor of the University of Staffordshire, reflects on the messages arising from a week of higher education news. Higher education leaders must be ready to think ahead and resist the temptation to respond only to short term changes in the current turbulent policy environment, says Rachel Hewitt, Director of Policy and Advocacy at the Higher Education Policy Institute. Vice-chancellors have raised concerns over planned new immigration rules that would require all EU students and academic staff coming to the UK to be sponsored. 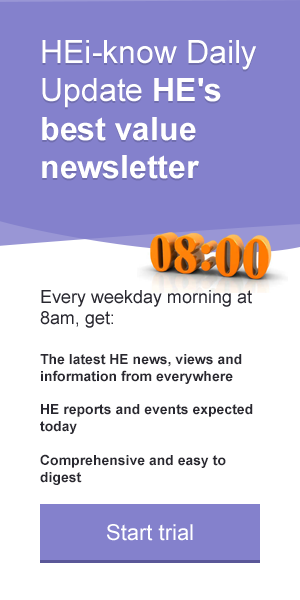 Uncertainty was the dominant theme in last week's HE news, and it looks like the sector can expect more of the same into the New Year, says Ross Renton, Pro Vice-Chancellor for students at the University of Worcester, in the third of our weekly HE news reviews. Universities leaders in Scotland have criticised a real terms budget cut for higher education. More women are rising to top posts in UK universities, but turbulence in the sector means turnover remains high among HE leaders, a new HEi-know survey has found. Educational "snobbery" -- would Oxbridge accept T levels? Mike Ratcliffe, Academic Registrar at Nottingham Trent University, reviews HE sector news in a week when T levels, educational “snobbery”, Oxbridge admissions, and a new universities minister made the headlines. Professor Mark Smith, Vice-Chancellor of Lancaster University, and Nicola Owen, Lancaster’s Chief Administrative Officer and Secretary, kick off a new series of HEi-know weekly higher education news reviews, highlighting and commenting on some of the most significant and interesting HE stories and opinions of the past week. A growing number of students from disadvantaged backgrounds are gaining places at medical school with lower-than-usual entry grades through “gateway” courses, according to a new report . Employers should pay a levy for each graduate they employ to help fund tuition fees, according to a new report. Proposals to lower tuition fees or vary them by discipline may seem appealing to politicians, but introducing such changes will require very careful handling to avoid creating additional problems, warns Professor Jon Scott, Pro-Vice Chancellor for Student Experience at the University of Leicester. Students are engaging more with staff and undergraduates who commute to university have high levels of involvement in campus life, a new survey has found. A national poll of the public on their perceptions of universities has produced mixed results. The votes are in and the result is unequivocal. The most influential higher education report of the last decade is the October 2010 Browne report: higher education funding and student finance , according to a range of experts. HEi-know asked 12 higher education experts to name what they see as the most influential HE reports of the past decade. Here are their views. The government should set "clear and ambitious targets" to grow the number of international students studying in the UK, MPs have said. Universities must ensure they are working effectively with partners to support students' mental health and wellbeing, Office for Students Chief Executive Nicola Dandridge will tell MPs today. The graduate unemployment rate is at its lowest level in 39 years, a new analysis has revealed. report by Prospects, the graduate careers advice charity, shows that the unemployment rate for graduates six months after leaving university fell to 5.1 per cent this year – the lowest since 1979 when it was 4.9 per cent. Universities will be “willing contributors” in the drive to publish ethnic minority pay differentials and some already make the data public, according to an equality think tank. A big expansion of degree apprenticeships “is crucial” to create a high-quality system that can plug the skills gap, according to MPs. The Office for Students has launched a new competition for funding of up to £500,000 for universities and colleges looking for innovative ways to help students find graduate-level employment close to home. University leaders fear an industrial relations "perfect storm" could be gathering with disputes over pay, pensions and jobs. HEi-know looks at the latest position. Businesses hired significantly more graduates, apprentices and interns this year, but employers have made little progress on improving the diversity of their intakes. Universities still making false marketing claims, says Which? A number of universities are presenting unverifiable marketing claims making it difficult for prospective students to make informed choices, according to a new Which? University investigation. Stephen Isherwood, Chief Executive at the Institute of Student Employers, responds to the publication of the Migration Advisory Committee report on the impacts of international students in the UK. Completing a part-time degree in your late 30s is associated with an increase in lifetime earnings of up to £377,000 in cash terms, a new study commissioned by the Open University shows. Following encouraging comments from universities minister Sam Gyimah on Universities UK's call for the re-introduction of a post-study work visa, Professor Sir Keith Burnett, the outgoing President and Vice-Chancellor of the University of Sheffield who co-founded the #WeAreInternational campaign with the President of the Sheffield Students' Union in 2012, argues that now is the time for the government to back up its welcoming words for international students with a welcoming policy change. University UK's annual conference, held at Sheffield Hallam University, kicked off the academic year with speeches and debates on a wide range of burning issues, including Brexit, fees and funding, overseas students, public perceptions of HE, value for money, freedom of speech, and student mental health. HEi-know asked Higher Education Policy Institute Director Nick Hillman, Staffordshire University Vice-Chancellor Professor Liz Barnes, and Lancaster University Vice-Chancellor Professor Mark Smith, to give their personal perspectives on the event and its themes. Universities must do more to win the public’s trust and battle negative perceptions over key issues such as the value of the courses they provide and their contribution to the UK economy, delegates at Universities UK’s annual conference were told. A new online course - the first of its kind - has been developed by the British Council to help international students prepare to study at a university in the UK. Val Yates, Director of Access and Inclusion at the University of Worcester, raises the curtain on an annual access and continuing education event, now in its 25 th year, taking place at her institution this week. Universities that are rated highly on Facebook and other online review sites tend to do better in formal measures of learning and teaching, new research suggests. Key findings of the latest Student Academic Experience Survey from Advance HE and the Higher Education Policy Institute are outlined and examined by Jonathan Neves, Advance HE Head of Insights and author of a report on the survey results. The Committee of University Chairs has published a new voluntary code for setting the pay of senior university staff. Half of the institutions that reapplied to the Teaching Excellence and Student Outcomes Framework in 2018 saw their rating improve. New universities are challenging the historical hierarchy in UK higher education as a significant number leaped ahead of Russell Group institutions in the latest Guardian league tables . UK universities face significant uncertainty stemming from domestic policy volatility and the impact of Brexit, according to a report by the leading credit rating agency Moody's. With the deadline for HE sector responses to the government’s consultation on plans for the subject-level Teaching Excellence Framework rapidly approaching, Professor Jon Scott , a TEF panel member and Pro Vice-Chancellor (student experience) at the University of Leicester outlines the proposed next steps and options in the evolution of the TEF. Students who enter university with alternative qualifications to A level such as BTECs can benefit from better support to tackle barriers in their transition into higher education, a study led by the University of Sheffield has found. Over a quarter of students are so stressed during exam periods that they seriously consider dropping out of university, a new study has found. Higher education leaders from across the globe are gathering in Malaysia’s capital Kuala Lumpur to attend the British Council’s 12th flagship Going Global international higher education conference. HEi-think: Staffordshire is reaping rewards of thinking "what have we done for our students today?" Staffordshire University’s efforts to discover and respond to the needs of its students has helped it towards impressive results in the latest Complete University Guide rankings and Times Higher Education Student Experience Survey. But now is not a time for any university to be resting on its laurels, says its Vice-Chancellor, Professor Liz Barnes. Advance HE, UK higher education's newly formed agency, is setting out its stall and preparing to consult with the sector on the services it provides. Its Chief Executive Alison Johns outlines its plans and aims. As the Higher Education Commission gathers evidence for its inquiry into the export potential of UK HE, it is particularly keen to hear from HEIs about barriers to international growth as Brexit approaches, says Dr Mary Bishop, HE Commissioner, TEF Panellist, and JISC HE & Student Experience Expert. As higher education faces an unprecedented period of scrutiny and change, Claire Lorrain, Chair of the Association of Managers in Higher Education (AMHEC), looks at key issues to be explored at AMHEC’S annual conference in April. As we celebrate International Women’s Day , Professor Yvonne Barnett, Pro Vice-Chancellor Research at Nottingham Trent University and Professor Shearer West, Vice-Chancellor of University of Nottingham, look at what universities need to do to support female academics and how the two institutions are working together to do just that. Universities are responding to a growing student mental health crisis highlighted in a number of recent reports. HEi-know examines the context and looks at some examples of good practice across the sector. Dame Sue Black, professor of anatomy and forensic anthropology and Pro-Vice-Chancellor of engagement at Lancaster University, has won the 2018 Saltire Book of the Year award for her memoir: All that remains. A life in death. Glasgow School of Art has appointed Professor Irene McAra-McWilliam as its new Director. The appointment will initially be for one year and the GSA will in due course undertake a full candidate search. Since October, Professor McAra-McWilliam and Professor Ken Neil have been acting as joint interim directors following the resignation of Tom Inns. The University of Derby has signed a memorandum of understanding with Advance HE, making it the first higher education institution in the country to commit to embedding the agency’s best practice framework into all its programmes. A delegation from Chandigarh University in India was welcomed onto campus at Glasgow Caledonian University to formally sign a renewed memorandum of understanding between the two institutions. Meanwhile, Arts University Bournemouth has established new links with leading Indian design institutions after a visit to New Delhi. The delegation from AUB took part in an event promoting design education that was hosted by the British High Commissioner to India, Sir Dominic Asquith. Loughborough has become the first university in the UK to feature authentic student reviews on its website. Working with StudentCrowd, an independent student review service, Loughborough has set up a direct feed to pull through in real time ratings and comments about the university from its site. Nursing degree apprenticeships as a successful and sustainable route into the profession will forever be a mirage unless barriers to delivery are torn down, MPs have warned. Universities UK is bringing together university leaders, mental health experts, and students and parents to consider when a nominated family member or another appropriately identified person might be contacted if a student is suffering with poor mental health or in acute distress. The University of Sheffield is a founding member of a consortium of leading global universities launched in Xiamen, China. Nottingham Trent University is one of the first UK higher education institutions to sign the Social Mobility Pledge, which sees companies and institutions commit to working with local schools and colleges, offer work placements and apprenticeships and adopt open recruitment policies. The University of Derby, Chatsworth House Trust and the Devonshire Educational Trust are to work together to generate new opportunities for students. One of Britain’s most experienced television journalists, Newsnight’s Kirsty Wark, has received an honorary doctorate from University of the West of Scotland. The University of Leicester is to receive £85,000 from the Getty Foundation's Keeping it Modern programme to spend on a long-term conservation plan for its Stirling and Gowan-designed Engineering Building. Lancaster University is one of four universities taking part in the Cabinet Office’s Open Innovation Partnership, designed to bring civil servants together with academic experts to share ideas and develop solutions to policy challenges. Research England is launching a new fund in autumn 2018 to support the scaling up of existing, strategically-significant, internationally-collaborative research relationships between English Higher Education Institutions and universities and research organisations outside of the UK. Advance HE has announced plans to conduct a major review of the Athena SWAN Charter -- a flagship accreditation scheme which recognises the work of higher education institutions and research institutes to address gender equality within academia and research. Advance HE, the new sector agency to be formed from the merger of the Equality Challenge Unit, Higher Education Academy and the Leadership Foundation for Higher Education, has been formally launched after the three agencies signed the documentation to effect the merger. Universities have been invited to submit evidence to the Higher Education Commission's sixth cross-party inquiry, examining the export potential for the UK’s higher education sector. Over half of students feel the feminism movement is too radical, according to a survey conducted by The Student Room.